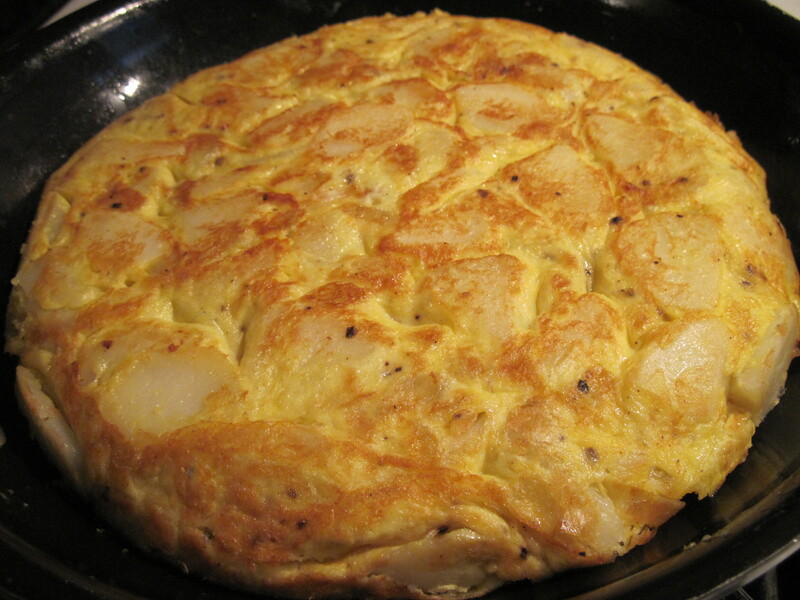 No vegetarian has ever gone to Spain without overdoing it on the ubiquitous “Tortilla de Patatas”. It’s basically a thick potato omelette which is served on it’s own, as a side dish, as a tapa, and in sandwiches everywhere in Spain. I usually avoid them when I travel, (viewing them as an emergency bus-stop lunch item), but if you can find someone local to make you a a really good tortilla de patatas, fresh, it can truly be a sublime experience. Here is the catch: after pestering many of our local Andalusian neighbors to show me how to make the real thing, I discovered that what makes the really good tortilla so delicious is that they are basically deep-fried from the inside out. Cut potatoes are slow cooked in massive amounts of olive oil for a long time, before being mixed piping hot with beaten egg and fried again slowly to set into the iconic tortilla shape. And I have to admit that when I am in the Suryalila kitchen, staring over the shoulder of a skilled Andalusian who is enthusiastically deep-frying hand-cut potatoes in a big sarten of homegrown olive oil, it all seems just fine… like the most natural thing in the world. But back here in my own kitchen in NYC, the thought of deep-frying potatoes in cups of olive oil sounds worse than appalling. So I decided to see if I could make an authentic-tasting potato tortilla using steamed potatoes instead of fried. And… it’s good! Not sublime… but almost as good as the real Andalusian thing, still using a high quality extra virgin olive oil but with no deep-frying required at all. Why is this important? In addition to a lot of controversy olive oil becoming unstable when heated to smoke point, there is also a carcinogenic chemical called acrylamide which is produced during high heat cooking of certain starches, like potatoes. Keeping cooking temperatures under 248°F reduces acrylamide levels significantly, so steaming and boiling potatoes is much healthier than deep-frying or baking. 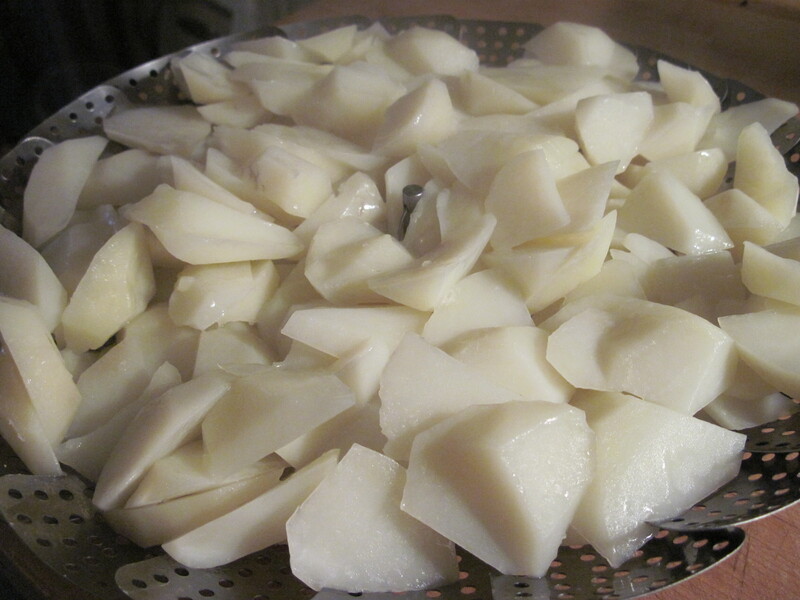 Cut potatoes into small pieces: In Andalusia, tortilla makers turn each potato in their hand, slicing off small evenly sized scallops from around the top edge with a paring knife and allowing each piece to drop into a bowl of cold water. This gives an interesting shape and allows the egg to slip between the cracks in the final tortilla. Steam the potatoes for 10 – 15 minutes until very tender, but not mushy. Keep hot. Meanwhile, in a 8″ – 9″ heavy non-stick sauté pan with steep, curved sides, sauté onions in 1 T olive oil and a pinch of salt until soft, sweet and golden brown. 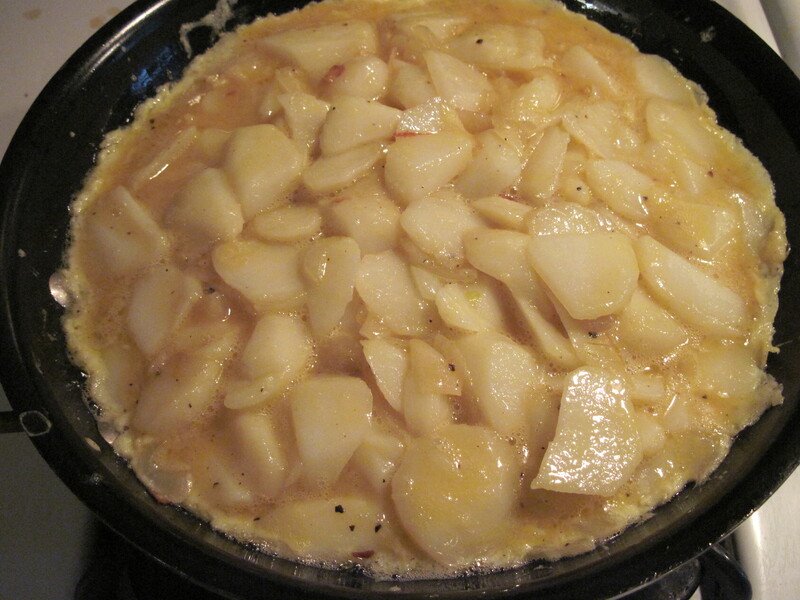 Add steamed potatoes to the pan and sprinkle with 1 t. salt, tossing gently lightly to coat. Remove from heat. In a large metal mixing bowl, whisk together eggs, 1 t. salt and pepper until completely combined. Add hot potato-onion mixture and mix gently to combine. Clean sauté pan and reheat with 1 T. olive oil until it shimmers on medium/high heat. Add potato/egg mixture all at once and immediately even out potatoes, pressing middle of tortilla down firmly in the middle and allowing the outer edges to creep up the pan. Lower heat to low/medium and run your spatula around the sides, pushing the egg/potato mixture down the sides of the pan towards the middle, rounding the edges and compressing the tortilla again. Repeat this squishing down and scrunching up movement a couple of times in order to ensure that the egg is releasing from the bottom of the pan, and also to put the maximum amount of egg in touch with the hot pan and potatoes. Allow the tortilla to cook slowly on low heat for 5 -10 minutes, peeking in after 5 and reducing heat to make sure the bottom is not getting too brown. Run your spatula around the edges of your pan and jiggle it a bit, to make sure the tortilla is completely free on the bottom from the pan. then put the plate, upside-down, on top of the tortilla, and in one bold move… FLIP IT OVER. Do this fast and with complete commitment… and maybe also over a sink. The worst thing that will happen is that you get a bit of egg on you, but most likely, you will remove the pan and end up with a beautiful golden brown, half-cooked tortilla on your plate. Allow the tortilla to sit out on the plate for at least 15 minutes to firm up or allow to cool to room temperature before serving. *The egg in the middle of the tortilla should be just moist and slightly shiny – not cooked all the way through. The Andalusians really take this seriously and like it …wet. So, find what you are comfortable with, but if you find it’s too wet, you can always slide it back into the pan for a gentle reheat. If to be served on it’s own, cut into 8 pieces and try it alongside the Rich Spanish Lentil Soup with Quinoa and a tossed green salad. As a Bocadillo (sandwich): serve a warm slice of tortilla topped with a whole roasted green pepper in a split fresh baguette. (yes… I saw this one at the Madrid Airport). As a Tapa: cut tortilla into smaller, two bite squares and serve open face on a 1/2″ round slice of lightly toasted baguette, topped with a piece of smoky red piquillo pepper and a sprinkle of parsley. 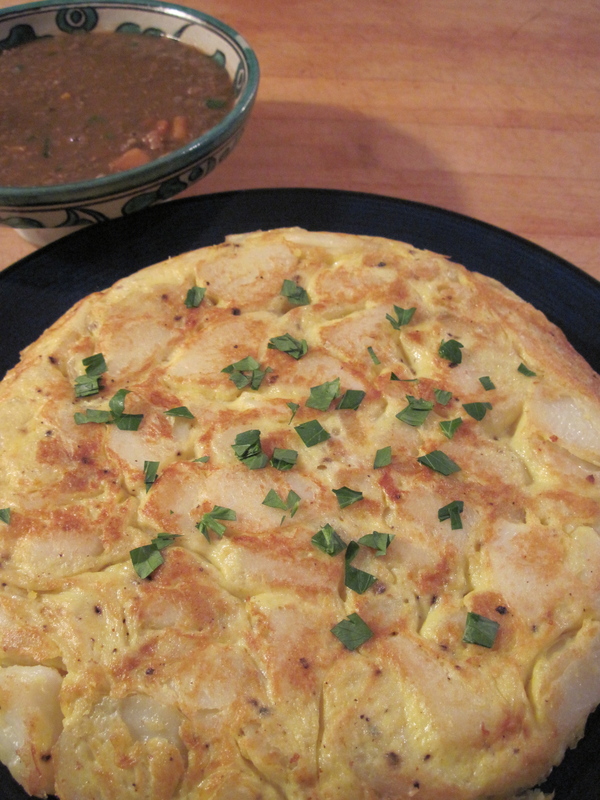 For a vegan version of this recipe, check out my (utterly inauthentic, but still good) Spanish Tortilla..with a Twist!